Iranian Foreign Minister Mohammad Javad Zarif today held meetings with Pakistan’s new Prime Minister Imran Khan and his Pakistani counterpart Shah Mehmood Qureshi in Islamabad to discuss ways to boost bilateral relations between the two countries, Iranian and Pakistani media reported. The two sides emphasized that they will cooperate more closely in different fields, particularly in counterterrorism, border security and trade and banking ties. Zarif also met with Pakistani Army Chief General Qamar Javed Bajwa. 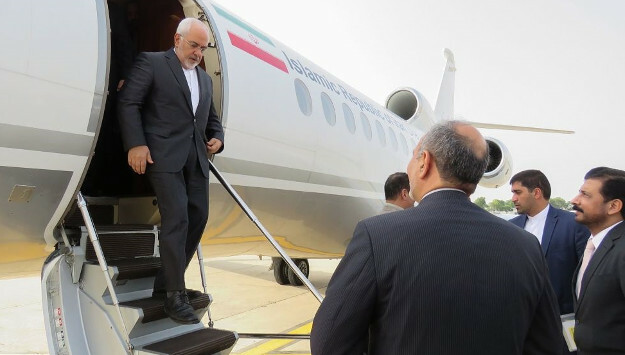 The top Iranian diplomat arrived in the Pakistani capital on Thursday for a two-day visit. He was the first foreign dignitary to visit Islamabad after Khan’s party won the July 25 elections. Pakistan’s foreign minister told Zarif that Islamabad supported Tehran’s “principled stance” in its nuclear diplomacy with world powers. “Pakistan stands with Iran in this hour of need,” Qureshi emphasized, implicitly referring to the Trump Administration’s re-imposition of sanctions against Iran. Zarif also stressed that “no third country” could adversely impact Pakistani-Iranian relations. The foreign ministers also discussed Afghanistan and the U.S. withdrawal from the Iran nuclear deal. Comment: Since Khan’s election victory, Iranian leaders have doubled down on efforts to improve their relations with the new government in Pakistan. After Khan’s victory, Iranian President Hassan Rouhani congratulated him and stressed that the two countries are “the strategic depth” of each other and need to strengthen their ties. Rouhani invited Khan to visit Iran, and according to Iranian media, the Pakistani prime minister accepted the invitation. As Pakistani media noted, Iran celebrated Pakistan’s Independence Day this year with a great deal of fanfare, displaying large banners in several Iranian cities. Tehran wants to exploit troubled relations between Islamabad and Washington to forge closer ties with its southeastern neighbor. Tehran believes that it can become part of a regional alliance including Pakistan, Russia and China to shape up regional issues and counter American influence in the region. Iran is also taking steps to expand its trade and banking ties with its neighbors, including Pakistan and Turkey, to minimize the impact of U.S. sanctions on its ailing economy. Pakistan’s new prime minister also appears willing to distance himself from Washington and get closer to Iran as well as other regional powers such as China and Russia. In an interview Iran’s Fars News Agency after winning the elections, Imran Khan said his government will expand all-out cooperation with Iran and reconsider its relations with the United States. He added that cultivating closer ties with Iran benefits Pakistan and pledged to work with Tehran to enhance counterterrorism cooperation against ISIS and bolster bilateral trade ties, particularly in the energy sector. “Unfortunately, the Pakistan Muslim League was unable to resist American pressure on the implementation of the gas pipeline project from Iran. But the Tehreek-i-Insaf will do its utmost to import energy from this country,” he emphasized, adding that the price of Iranian gas is cheaper than that of liquefied gas Pakistan imports from other countries. Khan’s pledge to expand energy cooperation with Iran comes at a time when the Trump Administration has reinstated sanctions on Iran and has warned all other countries to refrain from doing business with Iran or face consequences. U.S. Secretary of State Mike Pompeo is traveling to Pakistan next week. While his main discussion with Khan is expected to be about Afghanistan, the enforcement of U.S. sanctions on Iran may also be on Pompeo’s agenda. It is highly unlikely that Washington will issue waivers to Pakistan for the latter’s trade and commercial ties with Tehran. If Khan moves Pakistan closer to Iran, he may also draw the ire of Saudi Arabia. In his phone conversation with Rouhani, Khan offered to mediate between Tehran and Riyadh and accused Israel of “playing a key role” in fomenting tension between the two Muslim nations. But as tension is heightening between Iran and Saudi Arabia, Khan may find it hard to maintain a balanced and neutral policy toward the two rival Middle Eastern powers. Indeed Khan had objected to Pakistan sending troops to aid the Saudi-led coalition to fight Iranian-backed Houthi rebels in Yemen.